Unsurprisingly, modern industrial applications are being implemented in various industry sectors. Take, for example, the food industry uses conveyor belts controlled by advanced computing equipment for large-scale operations. Distribution agencies, such as Amazon, take advantage of warehouse robots for logistics applications. Although each of this industry has different applications, it all has one purpose; to maximise its productivity. This is the main reason why these industries installed the most suitable computer technology for these operations. Along with industrial-grade PCs, ruggedised peripherals such as pointing devices are also embedded in the system. But, given the fact that industrial computers have remarkable features, what could be the possible benefits of an operator if they integrate industrial pointing devices to these systems? 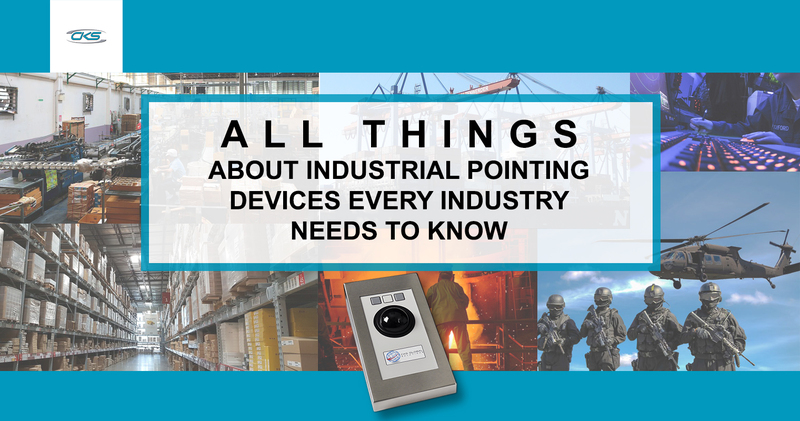 In the succeeding sections, uncover more about how industrial pointing devices have helped redefine various industrial processes. In the past, pointing devices were strictly used for classified military war operations. The U.S. armed forces, in particular, consistently promoted the computer and peripheral development for defence purposes. As a matter of fact, the demand for more precise pointing devices was the key to developing the modern touchscreen technologies. Technically, an industrial pointing device is a computer peripheral used to input commands, navigate, and configure the computing systems. Then, sensors detect and translate the commands onto the PC. These devices are used for complex computing operations for several industries. And, by utilising it effectively can reduce delays between tasks and allows for more optimised procedures. Let us look at several key industries and how utilising ruggedised pointing devices helped maximised their operational efficiency. Do you know that touchpad pointing devices were originally developed to minimise bulkiness? The first commercially available touchpad was integrated onto the 1982 Apollo Desktop [Spice Works]. This revolutionary design allows for more precise actions and consistent functionality. It also has a compact dimension, making it ideal for facilities with limited space. Fortunately, it was the food processing industry which benefitted the most from this technology. Food industry plays an important role in every society. It has a system that typically involves breaking down raw foodstuff into pre-made meals. It needs to be efficient and must produce safe food products. That is why most food manufacturers use a systematic food processing to prevent or remove harmful toxins and inhibit bacterial growth. Moreover, these systems are designed to extend the product’s shelf life. Thus, making it easier to store in closed areas for later use. But, like any other industries, the food sector is also facing challenges. For one, food factories must follow strict sanitation codes and local health regulation. As a result, regular maintenance in addition to scheduled inspections is required. But, processing food products to satisfy the demand whilst adhering to the rules is also a daunting task. Cleaning computing devices and peripherals can reduce its responsiveness due to the chemicals involved. But, having installed industrial-grade computing devices with ruggedised peripherals can be made for these operations. Food processing plants have regulated temperatures to inhibit bacterial growth. That is why most area temps are either below 0°C or above 45°C. Therefore, commercial-grade peripherals cannot withstand these conditions. But, this device is designed to operate optimally at temperatures from -20°C to +60°C. It is also built with a ruggedised construction frame to resist shock damage. So, expect that it can maintain its precision and accuracy even with the presence of shock and vibrations in food processes. This device can have flexible dimensions and can be fitted onto places with limited space. So, a workstation does not need a modification because of its mobility. The touchpad also features a fully customisable key button programming. This makes it ideal for processing tasks which need specific button commands. So, operators can maximise their work efficiency by using the TP Touchpad by implementing specific commands. Logistics is involved in planning, coordinating, and managing the movement of goods and resources. Distribution is a channel in which a product is sent from the processing facility to the customer. But, both face similar challenges. So, when it comes to efficient product handling and processing, nothing is more important than a streamlined distribution and logistics operation. Did you know that an automated system is implemented in distribution and logistics as far back as 1991? Then, as the years passed by, this system was upgraded. And now, automation is crucial in large-scale operations for fast and seamless handling and movement of finished products. But, one major issue for the automated process is that it requires reliable computing devices and peripherals as well. This is to ensure that operators can have a maximum control over the system, should problems arise. Good thing, only industrial-grade computing equipment has the capability to function well in extreme working conditions like distribution has. And, integrating the most suitable peripheral device is a great option for distribution application. Now, what makes it different from any other peripherals available in the market? Check out the next section below. Unlike conventional tracker balls, the TB 38 Trackball bears a compact device designed for distributed applications. Its physical dimensions can be customised to make sure that it fits the areas with limited available space. As you can see, our TB 38 trackball is compatible with multiple interfaces; making it ideal for systems requiring reliable PC connections. It is also made of phenolic resin material, which has an expected lifespan of 1 million switch cycle. So, expect that this device can perform its functions well for a long period of time. Therefore, it provides the best input solution for distribution processes. Throughout the history, various technological advancements have ensured successful military operations. In fact, most modern day computing systems, such as GPS which run on military-grade PCs, were developed for these applications. You could say that military campaigns pushed towards developing efficient and accurate computing devices along with its peripherals. But, way back in the late 1950s, Robert Everett and Jay Forrester, developed the first large-scale high-speed computers; the Whirlwind computer. It was the first device to use a revolutionary peripheral device called a light pen. Its main function is to effectively input information on the CRT monitor, which was primarily used for military applications. In today’s technology, military and even aviation industries use industrial PCs with ruggedised pointing devices built for the harsh working environment. But, what capabilities should these peripherals possess to perform military applications? Military ops often bear varied climates and vastly different types of environment. Hence, its military equipment must be reliable enough to operate under these conditions. This is especially true for military drone surveillance ops. Machine operators must have complete and accurate control of the aircraft to ensure successful operations [Birmingham Policy Commission]. For these operations, reliable and functioning pointing devices, like TB 38.1, are needed to perform these applications. Given the fact that the military operation is exposed to the extreme environment, installing the TB 38.1 mm trackball is recommended. Here’s how this pointing device can be utilised in military applications. The TB 38.1 industrial pointing device is built with an IP65K and NEMA 4-sealed stainless steel construction frame. This feature can prevent water, dirt, or oil from damaging the device and its components. It also ensures the device’s functionality despite accidental exposure to these materials. This trackball model bears multiple compatibilities with various computer interfaces. It can also have a custom interface to fit the application’s need. Expect that there will be no lag time between the command input and transmission. One concern when remotely controlling military drones or UAVs is that accidentally moving its pointer interferes with its controls system. Without proper supervision, it could send the aircraft off-course. But, the TB 38.1 trackball is embedded onto a bezel case. So, it can prevent unnecessary movement from interfering with operations. Its compact design makes it easier for operators to conduct operations as well, despite restricted space. Thus, it helps in maximising the operational efficiency. In terms of disadvantages, there are still no issues occurred when using this device. Clearly, it was specifically designed for the complex task which requires maximum precision. For thousands of years, metal manufacturing was a vital part in building great civilizations. To start with, ancient Hittites and Philistines mass-produced metal weapons for their successful campaigns. Moreover, medieval castles, which can be found across Europe, were also reinforced with processed metal. Indeed, metal production was a massive contributor to building nations. But, the techniques used in this process remained relatively unchanged for several years. It was only during the 19th century did it undergo major changes. Steel production in the 1850’s used the Bessemer process and Siemens-Martin process. The former was an inexpensive method to produce molten pig iron. The latter was an open hearth furnace which removed metal impurities whilst allowing operators to produce the alloy. These systems became more common in the succeeding years which led to multiple infrastructure projects. But, these were eventually were streamlined as new technologies became available. Today, modern steel production utilises new furnace techniques and computer systems to produce high-quality steel products. And, metal products currently have a high demand for certain industries such as the automobile manufacturing. Now, what other challenges could the steel industry be facing? One of the most important factors in large-scale steel production is maintaining the product’s quality. That is why operators use reliable computing technology to ensure a precise steel manufacturing process. In additions, their computing devices must be equipped with compatible peripherals to maximise performance. And, this includes installing ruggedised pointing devices. These peripherals must have the capabilities to function in high-temperature areas. Modern steel manufacturing utilises a six-step process to produce high-quality products [The Balance]. Each of these processes is monitored by an operator utilising an industrial panel PC. But, all these processes can be enhanced by installing a TB50 pointing device to industrial computers. Here are the top reasons why steelmakers must opt for this pointing device over others in the market. This device bears an ergonomic shape and is relatively easy for operators to use. It is designed for OEM systems. This maximises its compatibility with computing systems commonly used for metal production. Water and metal dust are common by-products from the production process. These materials can potentially damage a device’s internal components. But, this device features an IP65K protective sealing. This assures the user that this trackball can function effectively despite being exposed to these materials. The peripheral’s phenolic resin trackball fits seamlessly with the bezel mount. It can be installed at a 90o angle. And definitely, it can still function optimally with no obvious performance loss. Nowadays, there is much available computing equipment offering better performance. But, do note that not all pointing devices are designed and created equally. This simply means that choosing the most suitable pointing device is necessary for every industry.